Old age behind bars: how can prisons adapt to the needs of increasingly elderly populations? In many countries around the world, the number of older people in prison is growing fast. In the fifth expert blog in our anniversary series, Bridget Sleap, Senior Rights Policy Adviser at HelpAge International, outlines some of the challenges that older prisoners face in prisons, which – whether in terms of their lay-out, regime, healthcare provision or the rehabilitative activities on offer – are largely designed for younger people. She argues that this most vulnerable group of people must be included in the debate around the need for greater protection of all human rights in older age and in particular in the context of a new UN convention on the rights of older people. 1st October is the International Day of Older Persons. This is one of the least known UN international days and it is highly unlikely that it will be marked in any prisons although, given the increasing numbers of older prisoners, perhaps it should be. Human Rights Watch recently calculated that in the US the number of sentenced federal and state prisoners who are age 65 or older grew 94 times faster than the total sentenced prisoner population between 2007 and 2010 (1). In the UK, older prisoners are the fastest growing group within the prison population; the number of those aged over 60 grew by 120% and those aged 50–59 by 100% between 2002 and 2013 (2). In Canada the segment of the prison population over the age of 50 grew by more than 50% between 2001 and 2011 (3). Increasing numbers of older prisoners are also reported in Australia (4) and New Zealand, where a special wing for older prisoners was opened in Rimutaka prison in 2011 (5). There is, however, a distinct lack of data available for low and middle income countries. The reasons given for this increase in the numbers of older prisoners vary. We are all living longer. Sentences have become longer and harsher. More older people are being convicted of historical offences, committed when they were younger. In Japan the number of prisoners over 65 increased by 160 per cent between 2000 and 2006, mostly for non-violent offences, such as shoplifting and petty theft (6). This increase is raising a number of questions about the treatment of older prisoners. How can prisons provide the physical and mental health care and other support services necessary for daily living that older prisoners may need? Who should provide this? 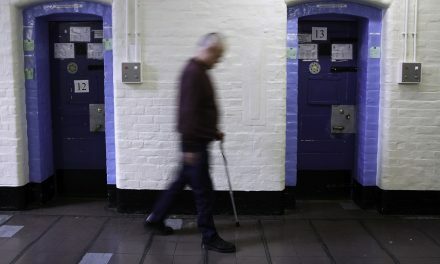 Should older prisoners be housed in special, more accessible units, separate from younger age groups? How can older prisoners be included in education and paid work programmes? When should early release be considered and what resettlement support is necessary? What constitutes a dignified death? Some common challenges older prisoners face include the fact that most prisons are designed for younger people (7). Layout, stairs, access to sanitary facilities, upper bunk beds, all of these can prevent older prisoners from satisfying their basic needs or prevent them from participating in activities. Prison rehabilitation programmes tend to cater for younger offenders in terms of skills training and education. Release programmes may not address the resettlement challenges older prisoners may face. Appropriate healthcare can also be unavailable: older prisoners may have complex co-morbidities that prison medical facilities may not be able to cope with. They may require assistance with daily activities such as eating, getting dressed and going to the toilet. Loss of family contact and ties can have a considerable impact on older prisoners’ mental well-being and rates of dementia are largely unknown (8). In Kyrgyzstan, where the Resource Centre for the Elderly, a member organisation of the HelpAge Network, monitored conditions in four prisons, older prisoners were living in unsanitary conditions with unglazed windows, were denied access to health care and medicines and adequate nutrition and had little communication with family outside the prison. They were also prevented from claiming their social security payments, which they are legally entitled to whilst they are in prison (9), and faced particular challenges re-integrating into society on their release. The United Nations Office on Drugs and Crime has issued a number of recommendations for sentencing and prison authorities to ensure that sentences do not have a disproportionately harmful impact on older prisoners and that prison conditions meet older prisoners’ needs (10). Elsewhere at the UN there is a growing debate around the need for greater protection of all human rights in older age and the potential of a new UN convention on the rights of older people. The rights of older prisoners have been mentioned in this debate in the context of responding to multiple and inter-sectional discrimination (where discrimination is based on two or more factors) and the need to pay particular concern to the rights of those older people in situations of heightened state control. This shift away from a welfare, charity-based approach to older people to one based on human rights is long overdue. It challenges us to stop using old age as a proxy for incapacity and rather to see our old age as a time of continued personal development and dignity, right up to the end of our lives and regardless of where we live. And, as the number and proportion of older prisoners increase, this is nowhere more important than in sentencing and prison policy and practice. Human Rights Watch, Old Behind Bars, The Aging Prison Population in the United States, 2012, page 6. Justice Committee, Older prisoners, Fifth Report of Session 2013–14,Volume I: Report, together with formal minutes, oral and written evidence, 2013, page 3. The 38th Annual Report of the Office of the Correctional Investigator, 2011. ‘Older prisoners— A challenge for Australian corrections’, Australian Institute of Criminology, Trends and Issues in Crime and Criminal Justice, August 2011. ‘As Japan ages, prisons adapt to going gray’ (New York Times, November 2007). United Nations Office on Drugs and Crime, Handbook on prisoners with special needs, 2009, Chapter 6. Moll, Losing Track of Time: Dementia and the ageing prison population: treatment challenges and examples of good practice, 2013. Article 31, Law on State Pension Social Insurance, 1997. Photo: HMP Wandsworth, UK. © Andrew Aitchison. Bridget Sleap is the Senior Rights Policy Adviser at HelpAge International. After working at Universidade Eduardo Mondlane in Mozambique for three years, Bridget completed a Masters Degree in International Human Rights at the Institute of Commonwealth Studies, University of London. Since then she has worked on human rights and development at the Panos Institute, International Family Health and now HelpAge International where she focuses on strengthening the rights of older people through the use of human rights mechanisms. Blogs are available here on our website and as podcasts on the 25th of each month from May 2014 to April 2015. Podcast: Old age behind bars – how can prisons adapt to the needs of increasingly elderly populations?